Home » Blog » Cars » Comments » Featured Articles » A Vehicle’s History – why is that so important In today’s world? Millions of people all over the world right now are buying a used car that has some sort of history surrounding it. Buying a used car these days can be a dangerous business unless you follow a simple set of rules that will help you purchase that perfect vehicle. Always insist on viewing the vehicle before you buy. There are lots of internet auction sites where you can pick up a bargain and buy a car online. Can you imagine turning up to pick up what you thought was a running Ferrari to find out that actually what you have bought was a box of bits because the seller neglected to tell you that the car was actually in pieces. Another thing that people are willing to do – is sell you a car online with no paperwork – make sure you confirm it has all its relevant paperwork so that you can get a vehicle history check done before you buy. Look for historical damage – look around the car for any signs of accidental damage. Check under the bonnet to see for there are any crease marks in the chassis or signs of fresh paintwork. Also check the boot floor for any signs of a rear impact. Freshly replaced bumpers and body panels are a good place to start, just as looking for any sign of crash repairs. Also check door gaps and panel alignment as this in the past has shown to be a good sign if a car has had some major repair work undertaken during its life. Check the mileage and service history of the vehicle. Get a history check to see if the car has had any recalls undertaken and if so, what sort of recall was it. Servicing is important – but can be expensive for the owner to do at regular intervals – so many people will skip the odd one to save money – but in the long run it will cost you when things go wrong. Buying a car with 100,000miles on the speedo and service history for only 40,000miles will not do because this means that some parts of a major service have been missed and this will affect its value and reliability – which needs to be taken into account when you buy. 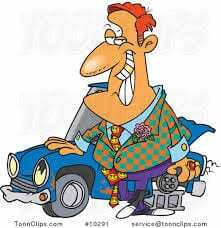 Get a vehicle report undertaken before you buy from a well know company. A vehicle history report is a service that offers a full vehicle history report related to any VIN number or registration. This report will help you to find out if a used vehicle you are looking to buy has ever been in a major accident or written off. The report will also check service reports, vehicle recall data and sometimes for an additional fee – you can have additional data like; a full salvage check, Book Valuation to see if what you are paying is actually what the cars is worth and to see if there is any outstanding finance on it. Final Thought: We all want to drive round in the safest car possible and have many years of trouble free motoring – So, it makes perfect sense to do your homework before you spend all your hard earned cash on that car of your dreams.